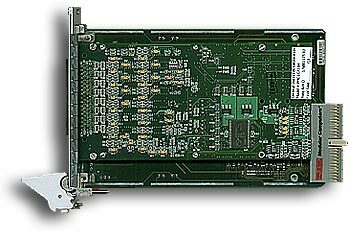 cPCI Multi-Function Input / Output Card | Marvin Test Solutions, Inc. The GX3216 is a multi-channel analog input and output cPCI module, supporting 16 differential input channels and two analog output channels. Dedicated 1 MS/s D to As and A to Ds allow simultaneous acquisition and generation of analog signals. Input ranges are software-selectable as ±10 V, ±5 V or ±2.5 V. The inputs are divided into two channel groups, with an independent software-controlled range assignable to each group. Two analog output channels provide software-selected output ranges of ±2.5 V, ±5 V or ±10 V and independent of the input range assignments. Output data is provided via two dedicated control registers, or through a 256 K-Sample FIFO buffer for waveform generation. Six bidirectional digital I/O lines are also available and can be programmed as inputs or outputs. The GX3216’s input channels are sampled simultaneously. Each channel’s sampled data is accessed via the PCI bus and a 256 K-Sample FIFO buffer. Sampling can be controlled in groups of 1 through 16 channels, and the sample clock can be generated either from an internal rate generator, software or an external source. Both burst and continuous sampling modes are supported. The two output channels can also be clocked at rates up to 1 MS/s and like the input channels, offer programmable ranges. Output clocking can be synchronized to analog input sampling. The module supports an auto-calibration routine which applies any required offset and gain correction values for all input and output channels. Additionally, a self-test input switching network routes output channels or calibration reference signals to the analog inputs – verifying module integrity and functionality. The GX3216 is supplied with a virtual instrument panel, which includes a 32-bit DLL driver library and documentation. The virtual panel can be used to interactively adjust and control the instrument from a window that displays the instrument’s current settings and measurements.